The large pins labelled pin 0, 1 and 2 can be used to create touch inputs. You can connect things like Play-Doh, tin foil, conductive paint or fruit to these pins. If you touch the object whilst also touching something that is connected to the GND pin. This is enough for you to test that your buttons work. 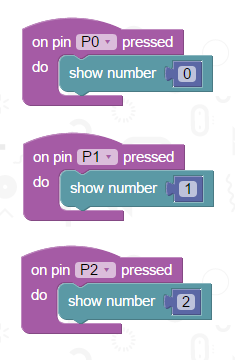 You can also just do this directly on the micro:bit with your fingers. Get a good grip on the GND pin. Tap away at one of the other 3 pins and the LED should tell you which pin you touched. Replace the numbers with images. If you have some crocodile/alligator clips, you can experiment with different objects as switches. You could go large with your switches and operate them with your feet.